The City of Pittsburgh is a mecca for bicycling. That has not always been the case, and perhaps there is still room for improvement, but from my earliest days in the city, way back in the late 90’s when it was considered one of the least bicycle-friendly places in the US, I found the overhanging branches shading the streets, the tough climbs and winding downhills, the noise of the street mingling with children playing in parks, the forests that grow all through the city’s limits and afford a complete escape from urban life, all of it inspirational while pumping two pedals. Today the city has some 5,000 bicycle commuters, according to estimates, and if only a handful of those who choose to ride bicycles in the city are actually “commuters”, that could put the overall cycling population in the tens of thousands. With over 30 miles of bicycle lanes, some 500 bike racks and a more than healthy Critical Mass participation (a “critical mass” is where cyclists join together in troves to ride through a portion of a city, in an effort to demonstrate how popular bicycles are in a particular urban environment), the city now ranks as the 13th most bicycle commuted city in the nation. Wand’rly spoke with Scott Bricker, Executive Director of Bike Pittsburgh, the city’s primary advocacy group for pedals and uphill pushing, about what’s going on with the PGH in terms of human powered transportation these days. A native of nearby Beaver Falls, Pennsylvania, Scott attended the prestigious Carnegie Mellon University before cycling across the US to San Francisco, where he spent a few years spiraling further into the spinning spokes of bicycle culture on the West Coast’s most beloved city. “It was 2002,” he tells us, “I had just moved back to Pittsburgh from living in San Francisco for a couple of years, and the difference between riding in SF versus Pittsburgh was stark.” In comparison, San Fran is ranked 4th to Pittsburgh’s 13th in terms of most bicycle friendly cities in America. Ten years later, the bikepgh.org site has grown into a full-fledged resource for cycling around the ‘Burgh, from forums where people can organize rides and commuter pools, to blogging all the latest cycling news, and infinitely more. Bike Pittsburgh organizes annual festivals, ride events and, perhaps most importantly, has their nose in the city’s infrastructure planning, always doing whatever they can to insure that any new development takes cyclists into consideration. Thanks to Scott and the rest of the staff, everyone from the Mayor to mom and pop shops to teenagers are getting behind bike advocacy in the city. Still, Scott puts Pittsburgh today at about where Portland, Oregon—the nation’s most bicycle friendly city, with almost double the percentage of cyclists to the runner up, Seattle—was ten years ago. Pittsburgh is teeming with bike riders, and that’s a great thing. It sounds like a nightmare. Why would anyone even bother to brave the streets if there are literally horror movie plots being played out in the city? I would feel obligated to mention percentages, statistics here. In a city of some 300,000 residents, that is a small portion of the population. Still, to families affected and the lives lost, two is a very large number. “Despite these horrific stories,” Scott turns a cheek toward the sun, “there’s a lot to be optimistic about. We think, and this is just a theory, that although the number of crashes might be going up that the overall percentage of bicyclists involved in crashes is going down. In other words, the chance that any one cycler might be involved in a crash is going down. We’ve seen this played out the world over. The more people who ride bikes, the safer it is to ride bikes.” As more bicycles are being ridden around the city’s streets, people become more aware of the reality that you need to pay attention to more than just your fellow automobile drivers. As an advocacy group works toward getting more signage, more literature, more exposure, it becomes more accepted that cars must learn to share the road with other modes of transportation. It can seem absurd for the generations raised on loving and accepting automobile traffic to think they should need to drive more slowly, be more aware, all for the sake of those choosing to push themselves around on bikes. Many people, without the education an organization like Bike Pittsburgh provides, assume bikes are supposed to be on the sidewalk, not the pavement. 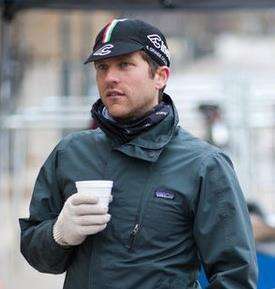 Bike Pittsburgh's Scott Bricker. Follow him @sbrix. The organization, comprised of five full-time members, a part-time membership assistant, and maybe a small army of occasional interns and volunteers, now has more than 2,000 dues-paying members. Twelve thousand folks subscribe to their monthly newsletter. Their website’s forum has some 23,000 registered users. Scott talks to what these numbers mean in terms of actual cyclists. If we’re even talking about 20,000 folks, that would be around 15% of the city’s population who are at some point in their days hopping onto a couple of wheels and making their way up and down the city’s landscape. So where are some of the best rides in town. According to Scott, “Personally I’m a big fan of riding around Fox Chapel and the Green Belt. I also really like riding up to North Park and taking a couple of laps around the lake and heading back to the city.” Before you hop on the back of your rental cycle and make your way in that direction, though, note that Scott—a guy who makes his living on the back of a bicycle—might be a bit more prepared for a trek like this. “It’s only about 40 miles total.” He says it like it’s as easy as opening the fridge to pull out a jug of milk. Still, he knows that the city is one that’s made for those in a particular level of shape, or at least one that will get you there quickly. We’ve written up a complete ride through of our favorite route, a 7 mi. 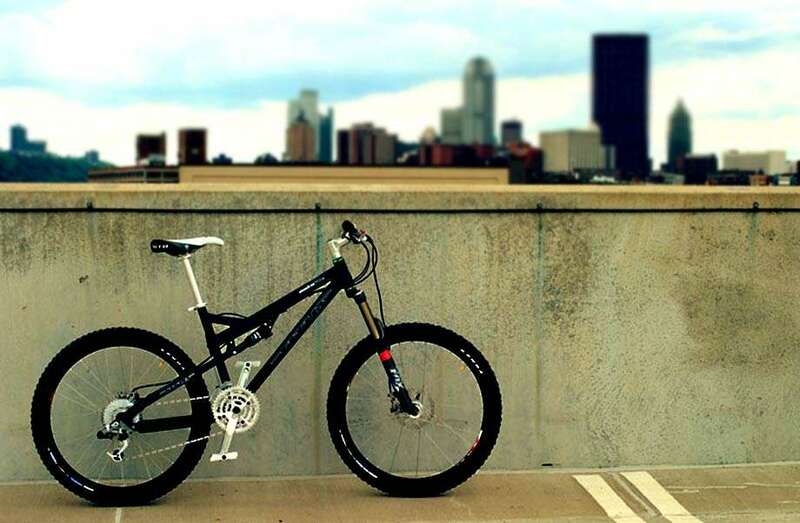 ride through Shadyside, Mellon Park, Homewood Cemetery, Squirrel Hill and Schenley Park. Read about the family friendly route.